You're picturing bright, crunchy broccoli as the perfect complement to your dinner entrée. The only problem is that the only pan that your steamer fits is soaking in the sink from last night's dinner. 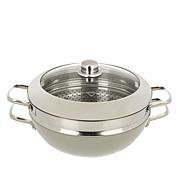 Ming's step steamer ensures you have plenty of options for steaming your favorite foods. 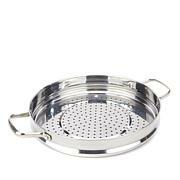 It fits three different pan sizes like a glove and doubles as a colander for draining. Isn't it time you stepped up to smarter steaming? Excellent sz and can actually fit in pot to simplify the use for draining or to lift items out of pot. The holes are the right sz for draining but are not so big that the noodles fall out. Would recommend to purchase. Fits in 4 of my pots! I love the versatility of this steamer I do not have enough room in my kitchen for 4 different steamers so the fact that it fits several sizes was a real bonus for me. 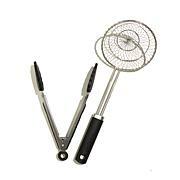 Very well made because it is stainless it will last for years. 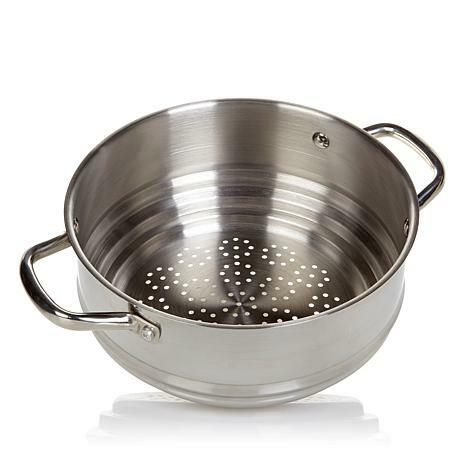 This is a nice steamer, does its job, looks nice, and fits a variety of pan sizes. It was a little bigger than I thought but that is perfect for me. I can steam a lot or a little. I recommend. Nice, solid steamer that fits in many different pans. Large enough for a very large head of cauliflower. Glad I can retire my old basket steamer now! No complaints. Best wedding gift. Get back to the simple joy of cooking! Because Ming Tsai believes life is complicated enough – in and out of the kitchen – he’s built his career around simple, delicious approaches to everyday cooking for family and friends. 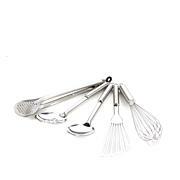 He applies his background in engineering to his Simply Ming Kitchen Collection to bring you cookware and tools that are carefully crafted and efficient by design. Remind me about Ming Tsai upcoming shows.